The spacious common room offers many possibilities to rest and relax. 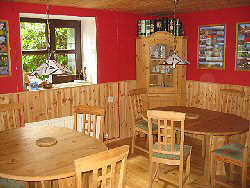 You can sit in front of the large bay window, enjoying a look into the garden or a good book from the hostel library. 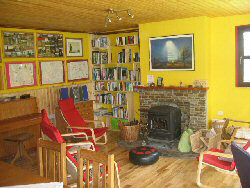 Or heat up in front of the fire listening to some traditional irish music. If you want to make your own music, piano, guitar or bodhran invite you to entertain yourself and hopefully the other guests. A large table can be used for the many board and card games provided. 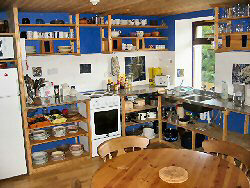 Very often the cosy kitchen turns out to become a focal point. The kitchen is fully equipped with everything you need to prepare your own meals that you will relish in the dining area where many pictures will give you ideas what to see and what to do in the area.